The biggest drawback to going cashless is the problem of uninformed merchants charging minimums or transaction fees. So are you tired of getting nickel and dimed as you go to use your credit or check cards? If you are still unclear on the different types of debit/check cards, be sure to read Credit or Debit? Plastic Explained first. Merchants see credit transactions as an additional cost. In general store owners pay between 1-3% per transaction to process your card. They also have a fixed transaction cost ranging from .15 cents to .45 cents. Different accounts have their own prices, but that’s generally the structure. A cost conscious owner decides they would prefer customers to use cash (after all there is no fee for cash right?). 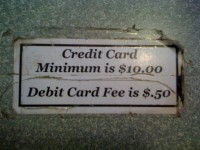 So the next day they craft a small homemade sign and tape it to the cash register with their new policy. $10 minimum purchase for all credit cards! Problem solved! Now customers will use cash, or purchase enough merchandise to cover any costs they have incurred by accepting plastic payment. In most cases it is against any merchant’s VISA/MasterCard agreement to charge a minimum, an extra fee, or in any way discriminate against those using plastic means of payment (with the exception of some schools and government offices). The other exception is debit transactions. Debit transactions may involve cash back and generally allow for the merchant to charge the card holder a fee. In no way are merchants allowed to require a minimum purchase (amount or quantity) or any extra fee for VISA/MasterCard transactions. Sometimes you will get punished twice and a merchant will try to charge you .75 cents for any purchase under $5.00. That is breaking one policy twice! Several years ago I took my wife to ice cream at a local ice cream shop. They arguably make the best ice cream in town. The door states that they except VISA/MasterCard. When I handed the clerk my check card for our $4 worth of ice cream (that we were already eating), she apologized and informed me they require a $10 minimum for all credit card purchases. Remember this is an ice cream shop! $10 worth of ice cream is a lot of something that is going to melt quickly! What would you do? Hand back the cone? Let’s just say it didn’t end pretty. Now I simply let them know to charge me according to their policy. I don’t put up a stink. You can even be kind and inform them that their policy is in violation of VISA/MasterCard terms and you will be reporting them. I do this knowing I have the final say and will get any fees reimbursed. In many cases the very next day you will see a credit in your account for the disputed fee. The merchant will get a letter informing them of the viloation of service and they may get a fine if they have been warned before. At last justice. Anyone for ice cream? Talking Point: What similar enforced policies have you seen or been frustrated with? This entry was posted on Monday, December 14th, 2009 at 8:24 PM	and is filed under Banking, Saving. You can follow any responses to this entry through the RSS 2.0 feed. You can leave a response, or trackback from your own site. Thanks for the nice post. I always try to bookmark financial or credit related posts like this one. Last week I dropped by this site and as usual great content and ideas. Love the lay out and color scheme. Is it new? Well I really really like it. I love the tips on this site, they are always to the point and just the information I was looking for. WordPress generated this page with 40 queries, in 0.221 seconds.